Summary: When Katia enrolled at Crossroads Academy she knew things weren’t exactly going to be easy. 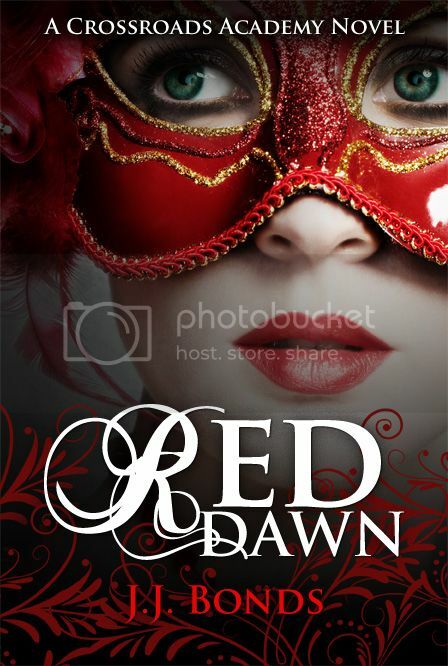 The sole heir to the worlds’ most powerful vampire, her presence was bound to cause a stir. But nothing could have prepared her for this. Whispers follow everywhere she goes. So does trouble. Bodies start turning up in nearby Rutland and Katia is sucked into a twisted web of danger and deceit. Haunted by nightmares she can’t explain and a thirst for blood that is never sated, Katia will do whatever it takes to keep her past buried. Nothing at Crossroads is what it seems and Katia’s secrets may be the darkest of them all. Rachel also designed the cover of Crossroads, the first book in the Crossroads Academy Series. It's amazing how Rachel can do so many gorgeous designs and this one so different from her usual ones yet sticking with the dark that's completely her signature! It's so gorgeous!! I thought I might be getting tired of all the mask covers going around, but this one is outstanding! And it's a boarding school setting---will definitely be checking this book out! That girl is ridiculously talented. So pretty. Gorgeous cover! I love the red of the mask, and the red of background design -- *just* enough to really stand out without being overwhelming. Glad to see everyone likes the cover! Rachel is a ROCKSTAR! She does AMAZING work! Honestly I think this cover is pretty amazing. I think they did a great job! I love this cover. I really have a thing for gala masks and this one is just gorgeous. It's absolutely arresting with the green eyes, the red mask, and the white skin! Gorgeous! I love the cover. It is so gorgeous. I can't wait to read the book. I love the cover of this book and can't wait to read. This cover is gorgeous!! I am a sucker for red on covers and I love how the red contrasts with her perfectly porcelain skin and green eyes!